I got on to writing books to share the knowledge I have accumulated along the way. 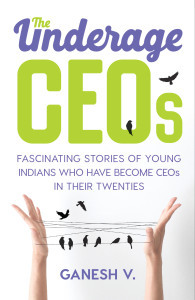 My first book ‘The Underage CEOs’ released in Oct 2015, and has subsequently been reprinted. It chronicles the fascinating stories of bright young Indian entrepreneurs, who are making a difference in their chosen domains. None of these youngsters graduated from an IIT or an IIM; and yet, they are all doing some ground-breaking work. Chosen from small towns and big cities, and from different fields, these stories clearly prove that when it comes to starting up, nothing matters more than your dream, your passion, your focus and your perseverance. Through ‘The Underage CEOs’, I want to inspire many more youngsters to take the plunge at an early age, but after understanding what entrepreneurship is all about. My heartfelt thanks to HarperCollins India for publishing the book. A book you cannot do without, if you want to do something different in life. Inspirational stuff!